ETU will demonstrate every day in front of the immigration office unil Kabir and Mohammed are released. Gwacheon, Korea--Migrant workers and their allies held a "symbolic" protest today to denounce the arrest and threatened deportation of Equality Trade Union-Migrants' Branch (ETU-MB) leaders Kabir Uddin and Mohammed Bidduth, in front of the government complex in Gwacheon, a suburb south of Seoul. Demonstrators also decried the recent government crackdown on hundreds of "illegal" and legal migrant workers, signaling an alarming shift from temporary amnesty for registered workers to open hostility, regardless of status. Over a hundred migrant workers from Bangladesh, Nepal, the Philippines, and other countries braved the chance of arrest to come face to face with the sprawling source of their exploitation and marginalization. They were joined by members of the Socialist Party and students from Kyung Hee, Suwon, and Sungkonghoe Universities. Workers, activists, and students chanted, sang songs, and made emotional speeches in Korean, English, Bangladeshi, and a number of other languages. They were also treated to a performance by "Zen", a radical hip-hop group that regularly performs at union venues. Throughout the rally, participants stressed the need for unity, solidarity with other groups both domestic and abroad, and the tireless push for basic labor rights. "We're the same people, but only the government thinks we're different," said a Socialist Party member. "The government talks about human rights, but they do not treat migrant workers like humans." Eun-guk, another Socialist Party member and a student at Kyung Hee University, said that students from his school help protect hounded migrant workers in Songsu-dong, an industrial area populated by 2,000 migrants and small factories. "We want a society where migrant workers can work and live like other Koreans," he said. In addition to the immediate release of Kabir and Mohammed and all others detained and the halt of the crackdown, protestors repeated demands of a permanent working visa and full legalization of all migrant workers in South Korea. On September 2nd, immigration officials, accompanied by 30 policemen, raided two migrant houses in Masok and detained 13 migrant workers from Bangladesh, including Kabir and Mohammed. Both were beaten during their arrest and taken to Hwasu detention house in Suwon, two hours south of Seoul. ETU officials believe they were targeted for their active involvement in a sit-in campaign at Myongdong Cathedral in downtown Seoul from April 28th to mid-July. The government has threatened to deport them back to Bangladesh, but an ETU-MB official expressed hope that this will be delayed because of a decision made a few years ago by the Ministry of Justice to review cases of unpaid wages and other such complaints claimed by migrant workers. At the rally, Kabir was able to address the people by phone and through a loudspeaker, rousing the protestors to keep up the struggle. Mohammed also tried to communicate with the rally but was cut off soon after he begin his speech. ETU officials called prison authorities, who responded that Mohammed was using an "illegal" telephone, though ETU suspects that he was forcefully prevented from calling them and possibly beaten. Juyeon Lee, secretary of the ETU head office, said that ETU will demonstrate every day in front of the immigration office until Kabir and Mohammed are released. Their arrest is part of a nation-wide government crackdown on migrant workers. "Maya", an ETU member, confirmed that around 200 people from 10 different countries were arrested in the Kyonggi-province last weekend, and many of them were brought directly to the airport to be deported. The World Socialist Web Site also reported that 14 migrant workers were seized at an unidentified railway station, and 11 of them are designated for deportation. ETU officials are still waiting for word on other arrests in other regions of South Korea. According to the ETU, there are approximately 400,000 migrant workers in South Korea. 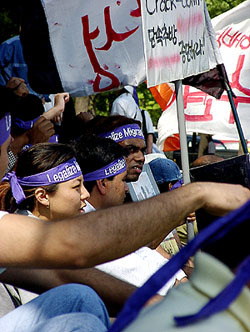 260,000 of them are considered "illegal" by the South Korean government, most of whom came under the notorious "trainee" program that requires new arrivals to work for meager wages, in dangerous conditions, with little or no adequate training and health benefits for abusive employers, living under the constant threat of police harrassment and periodic government crackdowns. If they seek work elsewhere, they are then deemed "illegal." 96% of these "illegal" workers are registered, which means 4%, or around 10,000 workers did not apply for the temporary visa. The arrest of "illegal" workers, and in particular vocal leaders such as Kabir and Mohammed, is not surprising. What is surprisng are the arrests and deportations of "legal" migrant workers, who had registered for a one-year working visa that was supposed to have afforded them protection from police harrassment and government deportation. 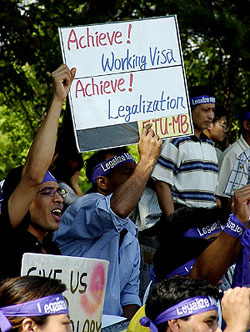 By violating their own agreement, not only has the Kim Dae Jung administration undermined their own reputation as a government that can be trusted, but they have clearly shown that migrant workers, whether affixed with flimsy labels such as "legal" and "illegal," are all subject to the whims of a government suffering from selective amnesia. To humorously emphasize the point, one protestor held a banner that read, "Voluntary Reporting=Exit Order/We'll Deport President DJ." ETU-MB has charged since the inception of the voluntary registration program that it was nothing more than a thinly-veiled mechanism for the regulation and gradual deportation of migrant workers to make way for cheaper foreigners unfamiliar with the political terrain of South Korea. In fact, it seems that ETU was wrong--it appears that the South Korean government intends to speed up the deportation process. In a speech, one Nepalese migrant worker and ETU member shouted, "We didn't come to Korea to die." Undoubtedly, the struggle to free Kabir and Mohammed and the rest of their comrades, as well as the movement for permanent legalization, will not extinguish.